About Us - Let's grow our passion for a healthy lifestyle together! Welcome to Flip Side Ninja Park, where you’ll find the perfect gym to test your ninja skills, enjoy a fun alternative workout, or provide some safe entertainment and fitness for the kids! Have you ever found yourself sitting on the couch watching American Ninja Warrior and thinking, “Man, I’d love to try that!”? Well, now you can! 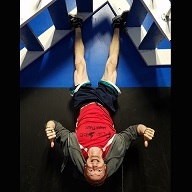 You’ll find many of the familiar obstacles (like the infamous Warped Wall) plus a vast array of never-before-seen and ever-changing obstacles to challenge yourself in new ways with every visit. Not really an athlete? No Problem! We have something for every skill set – from total beginners to full-blown ninjas - and all of our coaches cannot wait to help you have a blast while challenging yourself and reaching new goals. Flip Side is truly a place for every age, every shape and size. We can’t wait to see you! We're a veteran-owned family business, and we want you to be a part of our adventure. You’ll be treated like family here, not just another number. Caleb Benson is a 10 year veteran of the USCG and now the owner/operator of Flip Side Ninja Park. He's ready to share his passion for loving life and fitness with you! 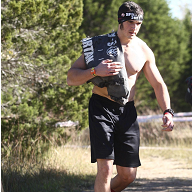 Caleb has been an extreme athlete for many years with experience base jumping, sky diving, mountain biking, OCR running, and blasting through ninja warrior competitions. He's ready to help guide you through this exciting new world of fitness! 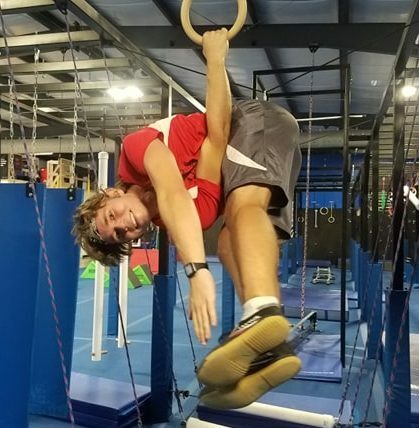 Caleb currently holds certifications as a USA Gymnastics instructor, and a level 1 & 2 instructor with the World Freerunning and Parkour Federation (WFPF). Emily Benson eats, sleeps, and breathes fun & functional fitness! She's ready to share that love with you! Emily's love for fitness started at a young age, but turned into a passion when she joined an aerial arts youth circus in high school. Through this opportunity she quickly learned that she never wanted to step foot inside a traditional gym with rows and rows of machines, but instead find ways to stay active and healthy that felt like fun, not work. If you don't see her behind the front desk at Flip Side, she's probably hanging on the silks, doing some acro with Caleb, or bouncing around the obstacle course. General Manager Gregg Spears has been involved with youth sports for 10+ years, from having his 3 children involved in many different sports to coaching boys and girls soccer at recreational and competitive levels. He has a passion for exceptional customer service and leadership development with 20+ years developing and leading high performing business teams. 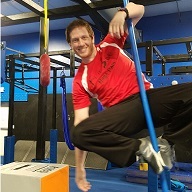 He joined Flip Side as General Manager because of the love he has for the ANW movement and the tremendous potential he sees for the improved and functional fitness for children and adults through obstacle training. Coach Kileab Ammons was “Kreated” for “Kreativity.” Born the oldest of 9, Kileab has always been comfortable in leadership roles. 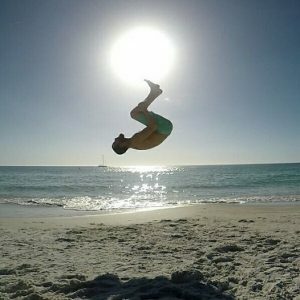 Kileab is a former collegiate athlete turned full time ninja and has coaching experience in everything from basketball to fishing and almost everything in between. 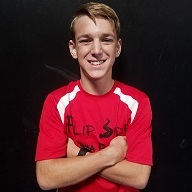 At Flip Side, Kileab is light hearted and easy going and loves to practice his dad jokes while simultaneously sharing important life lessons with the kids over the obstacles they are overcoming – physically and mentally. Kileab studied experiential education and has a Bachelors Degree in Youth Ministry. Coach Brad Ramey is a life-long student of all things involving athletics. Getting his start as a young martial arts instructor, Brad developed an early passion for seeing people reach their goals through dedicated training. 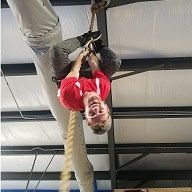 He built on this passion at the University of Arkansas by pursuing a Bachelors Degree in Exercise Science as well as joining the university’s Parkour club. 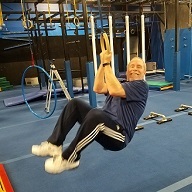 He is a certified strength and conditioning specialist (CSCS) through the National Strength and Conditioning Association (NSCA) and is a certified USA Gymnastics Instructor. Coach Brad has the tools and knowledge to help you achieve your goals! Coach Marek Stanley is a blackbelt in Taekwondo and made his way from student to coach over the course of his Taekwondo studies. After coaching 12-13-year-olds in Taekwondo, Marek heard about Flip Side and decided to bring his knowledge base to the Ninja community to see what he could teach and learn. Aside from coaching at Flip Side, Marek is currently practicing and studying general movement under the Ido Portal Method. Marek loves combining his passion for general movement and Ninja at Flip Side to teach agility, strength, and overall body awareness. Coach Shawn Wheeler has been training ninja long before Flip Side opened its doors. Growing up in MN, Shawn trained at Conquer Ninja Warrior under Sarah "Beastin'" Heesen, and incredible Ninja Warrior athlete. 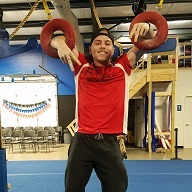 After moving to NWA, Shawn joined Flip Side and quickly rose to the ranks of coach after attending our Flip Side Semester and achieving the rank of Stage 4 "Elite Ninja," currently sharing the title with only 5 other students. Shawn is also a ninja competitor and took home first place in his last UNAA competition and will be going to Regionals this spring. Coach Matt Paxton has always had a love for fitness! After wrestling in college, Matt chose to continue his education and is currently finishing his Master’s Degree in Kinesiology. Matt has a passion for health and fitness and loves sharing his knowledge with the younger generations. He’s currently deciding the best way to utilize his education after he graduates and looks forward to coaching and training with your ninja(s) in the meantime. Coach Aaron Easterling has been a thrill seeker for most of his life. Starting at a young age he joined boy scouts and achieved the rank of Eagle Scout by age 14. Next, he started Taekwondo and worked diligently to achieve his black belt. Aaron now implements his knowledge of the sport by instructing younger students. After 5 years of soccer and competitive swimming, Aaron decided to broaden his horizons and take up rock climbing and ninja training. Aaron joined the Flip Side team and ninja training and coaching is now his passion that pushes himself and helps him push others to be better than they think they can be. Coach Jase Childers believes that fitness and fun go together like peas and carrots. Jase has been training as a personal trainer and group fitness instructor for four years and has employed his skills in physical therapy clinics and fitness facilities. Among other things, he specializes in weight loss and toning, muscle growth and strengthening, and athletic performance. Jase is a certified Personal Trainer by the American College of Sports Medicine and a is an ACE certified Group Fitness Instructor. He holds a bachelor's degree in Biology, a minor in Exercise Science, and is a Certified Occupational Therapy Assistant. 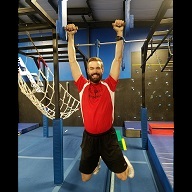 Coach James Pierce has a personal drive for challenge and excellence and is drawn to American Ninja Warrior style activities, a program that embodies the spirit of personal betterment. Utilizing that competitive dream, he has pushed his limits in obstacle course races and ninja competitions in our surrounding area. Coach Pierce’s goal is to impart his experience and passion to assist a new generation to challenge themselves into becoming “Obstacle Ninjas” with a sense of teamwork, camaraderie, and a helping hand mentality toward their fellow man. *All of our coaches have undergone thorough background checks, drug-screening, and are Basic Life Support/CPR Certified.